Is there any sort of massive public work that simultaneously benefits environmentalists, businessmen, and politicians? Yes, there is: Dams. One of the first examples of man’s attempts to control the devastating power of nature, the earliest dam in recorded history is said to have been built on the Nile River at Kosheish around 2900 BC, to supply water to the capital city of Memphis. This was a 49 foot high (14.9 m) masonry structure. Dams are constructed to supply water for human consumption, irrigation, and industrial uses. They are also erected for flood control purposes, to generate clean hydroelectric power, and to increase river depth for better navigation. In some cases, a lake is created, providing recreational opportunities, and quite often an enhanced wildlife habitat results. 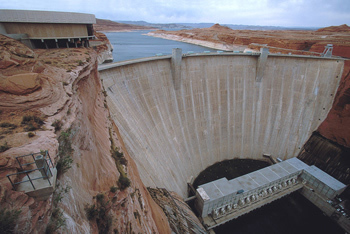 The larger and more famous dams, such as Hoover Dam, can become tourist attractions in their own right. To those admittedly few critics who condemn dam construction, as they decry any type of meddling with nature, we can counter with the enormous benefits of saving countless lives in areas long prone to damaging floods. But we would be remiss if we did not tout the wonders of hydroelectric power, as well. Courtesy of dams, hydropower in the United States resulted in the avoidance of 30 million metric tons of carbon emissions in 2002. And don’t forget the avoided emissions of nitrogen oxides, sulfur dioxide, mercury, lead, and other fine particulate matter known to cause health problems. In 1999, the Department of Energy identified 21,000 megawatts of unused hydropower potential at existing dams in the U.S. If developed, this potential would meet the yearly energy needs of 6.9 million homes and result in an additional 42 million metric tons of avoided carbon emissions. Of course, there are those who make the ludicrous argument that dams actually do produce carbon emissions because the initial excavation and flooding would have trapped plants that can produce carbon dioxide and methane. While true on its face, it conveniently disregards the same phenomenon caused by far more frequent natural flooding—analogous to the jejune notion that a naturally-induced forest fire cannot cause air pollution, but one set by man does. Hydropower is the most plentiful and most efficient renewable energy resource, contributing more than 90 percent of all renewable electric energy produced in the United States. The efficiency of a modern hydropower plant exceeds 90 percent, and that’s better than twice as efficient as a typical thermal facility. The original hydropower facility, dating back to 1882 in Appleton, Wisconsin, is still operating—at an efficiency closely matching its modern day cousins. The conventional installed hydropower capacity in the U.S. is about 73,500 megawatts, and is capable of producing over 300 billion kilowatt-hours annually. To generate the equivalent amount of energy from a fossil-fueled generating plant fired by oil, coal, or natural gas would require 520 million barrels of oil, 129 million tons of coal, or 3.16 trillion cubic feet of gas. On the flood control side, to cite but two examples, in a recent 12-year period, California’s Oroville Project saved more than $1.3 billion in flood damages. In 1997, Corps of Engineers dams on the Missouri River prevented more than $5 billion in damages, and the large runoff benefited protected birds (principally terns and piping plovers). To be sure, there can be deleterious environmental effects derived from dams, and these should be—and are—considered in proposed construction projects. It must be remembered, though, that ANY sort of development that might benefit mankind will by definition not leave behind a pristine environment. More to the point, as we are part of the ecosystem, it is purely natural for to change the natural environment; in this case, the same way our friends the beavers do.